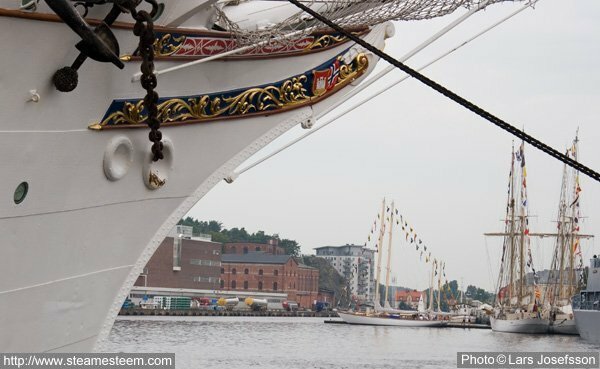 The Norwegian Barque Statsraad Lehmkuhl of Bergen visited Karlshamn in conjunction with a marine cadet meeting where the ship from the Nordic countries Finland, Norway, Denmark and Sweden participated. The Barque Statsraad Lehmkuhl is Bergen's training ship. It was built in Bremerhaven in 1914 under the name "Gross Herzog Friedrich August" as one of the German merchant marine training vessels. During the First World War she was taken as a price to the UK and she was bought in 1921 by the previous minister Kristofer Lehmkuhl. 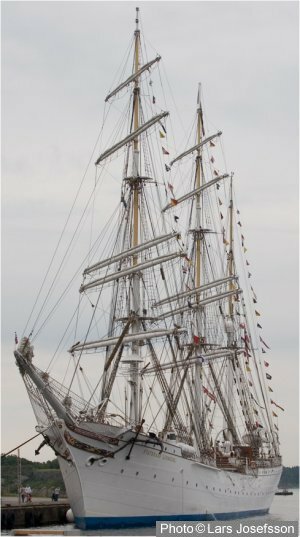 She was in 1967 in danger of being sold abroad, but Bergen shipowner Hilmar Reksten then bought the Barque Statsraad Lehmkuhl.